Are you an architecture fanatic? If so, then you would be truly amazed by the works of Antoni Gaudí. World renowned for his detail and structural creativity, this Catalan architect has forever impacted the era of modernism and the boundaries of architecture. His major works incorporate factors of religion, the natural world, colors and geometrical shapes. There are a total of 7 of Gaudí´s properties that are declared and recognized as World Heritage Sites by UNESCO (United Nations Educational, Scientific and Cultural Organization). These structures attract hundreds of thousands of visitors each year and are all located here in Barcelona! These seven monuments include Casa Vicens, Palau Güell, Park Güell, Casa Milà, Casa Batlló, Church of Colònia Güell, Sagrada Família Schools, and his most famous work, La Sagrada Familia. In his pieces, Gaudí typically integrated a variety of materials and crafts such as ceramics, stained glass, carpentry and wrought-iron work. 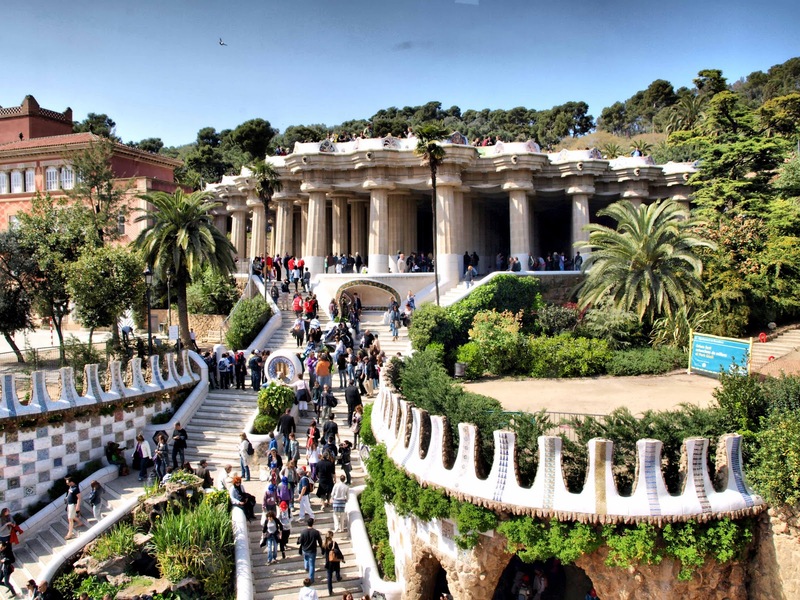 Some of the more popular sites include Park Güell, Casa Batlló, Casa Milà and La Sagrada Familia. In each of these works, Gaudí highlights certain aspects of the natural world. In fact, it is said that Gaudí loved reptiles! One might notice that the roof of Casa Batlló depicts a dragon’s or a serpent’s spine or that Park Güell is full of mosaic lizards! La Sagrada Familia, is by far the largest and most detailed property of Gaudí. To this day, the basilica is still not quite complete. There are three facades to the building known as the Nativity facade, the Passion facade and the glory facade. Many are amazed by the immense detail and beauty and his ability to portray the flora and fauna and certain aspects of the Catholic religion. The artistry continues in the interior of the building; incredible high-pitched ceilings and giant stained glass windows light the room with a rainbow of colors. The highest point of the basilica, the spires, is planned to reach an astounding height of 170 meters! There is no wondering why Antoni Gaudí has become one of the most influential architects of the modernist era. Once the properties were officially declared as World Heritage Sites, popularity has continued to grow. Gaudí’s legacy will never die as Barcelona takes much pride in maintaining and preserving the structures so that people from all across the globe may come and enjoy his creations! If you are interested in visiting any of these buildings or other works by Antoni Gaudi feel free to speak with our reception desk as we can provide you with directions and other information about these must see sites!